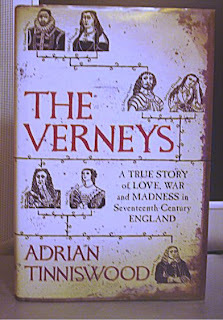 I became very fond of the Verneys as I read Adrian Tinniswood’s book The Verneys, shortlisted for the Samuel Johnson Prize for Non-Fiction 2007. If you’re interested in seventeenth century England you simply must read this book, or if you like reading biographies and family histories read this book. I think it would make a fantastic film or TV series. It is a tour de force, a mammoth of a book. It is huge, both in its scope, its extraordinary detail and its length. It is also heavy, but only in weight. It is impressive in its coverage of not only the lives of the Verney family but also of the seventeenth century itself. Of course every century is a time of change and none more so than the seventeenth century in England. If we disregard the last years of Elizabeth I reign it was the time when the Stuarts ruled England, violently interrupted by the Civil War and the Interregnum, which was in essence the reign of Cromwell. It was a time of political and social upheaval, revolution, war, plague, famine and fire. This book covers the lot. What makes it so very good is that the Verney family correspondence has survived – tens of thousands of their letters and Adrian Tinniswood has made a superlative job of weaving together their family story from the family archives and placing it within the national context. The sub-title is a summary in itself: ‘A true story of love, war and madness in seventeenth century England.’ The Verney family has lived at Claydon in Buckinghamshire since the 1460s. The book starts with the death of Sir Francis Verney at Messina in 1615 and moves through the seventeenth century to the death of Sir Ralph Verney at Claydon House in 1696. There are many Verneys, fortunately their family tree is given at the beginning of the book and I found it invaluable in keeping track of who was who. Sir Edmund Verney, the half-brother of Sir Francis, was Charles I’s Standard Bearer at the battle of Edgehill. His body was never found and the story goes that he died still clutching the standard. His oldest son, Ralph was at odds with his father, supporting the Parliamentary cause, but during the Cromwellian period he was suspected of royalist connections and went into exile in France. Ralph’s brothers were very different – Mun was a professional soldier, Henry a gambler and obsessed with horse racing, and Tom was a villain, a crook and a sponger. Ralph’s son Jack, who eventually succeeded Sir Ralph after the deaths of the his elder brother, Edmund (another Mun) and his sons, was different again. He went into commerce and spent eleven years as a trader in Aleppo with the Levant Company, before returning to England. There is so much in The Verneys – the horrors and atrocities of war, the ordinary day-to-day life of the landed gentry, the London social scene, Parliamentary elections, the cultural scene on the continent in Italy and in particular in France, where Sir Ralph and his family lived for a while in voluntary exile; life in the plantations of Barbados, in the forests of Virginia, in North Africa; and trading in the souks of the Levant. When Jack returned to England in 1674 it was to a London he didn’t recognise; all the landmarks he had known, including St Paul’s Cathedral, the Guildhall, the Custom House by London Bridge, warehouses, churches and many houses had all disappeared, destroyed in the Great Fire of 1666 and a new city was being built. I could imagine Jack’s shock at seeing this new London as the devastation was being cleared and new and renovated buildings rose from the ashes. The most vivid and to me the most interesting parts of this book are those dealing with the family and their personal relationships and the light that throws on the society in which they lived. The Verney women show that the accepted view of how the ideal woman should behave was not the norm, but was just that – an ideal. Whereas it was accepted that men would be unfaithful and their wives’ reaction was to be a dignified silence, women were supposed to be faithful, meek, modest and pious. With the exceptions of Mary, Sir Ralph’s wife and his mother, Margaret who were in successful relationships and held positions of power within the family, the Verney women just didn’t conform to this ideal. Some eloped, one slept with her sister’s unsuitable boyfriend, one separated from her violent husband, and some became pregnant before they were married. They were spirited, passionate women who refused to do as they were told. Tinniswood recounts the terrifying details of medical practices and treatment. As doctors began to discover the circulation of the blood, not everyone accepted it and still treated patients by blood letting under the tongue, for example, to relieve a fever and restore the balance of fluids in the body. The treatment of hysteria and madness is also fascinating, if somewhat extreme. The treatment included bleeding, purges and emetics – cures such as taking pimpernel juice through the nostrils and using suppositories of Castilian soap were recommended. Even more extreme was the practice of ducking the patient, stripped naked and bound, backwards suspended by the feet into a big tub of water, an ‘advancement’ on the medieval practice of ducking witches. Mun’s wife, Mary suffered from depression and eventually was diagnosed as mad, but fortunately her treatment was much more humane, although she did have to suffer having the head of a hare bandaged to her forehead for a few days, the idea being that the ‘melancholy hare’s brain would draw off the melancholy from hare-brained Mary, after which it must be ‘put into the feathers of a pillow whereon the party grieved must lie as long as they live.’ This was not prescribed by her doctors but was suggested by a local ‘wise woman’. She was looked after at home, although the doctors really had no idea of how to treat her and she spent most of her married life in fear and misery. A panacea much more to my liking is chocolate. It was a rarity in Western Europe at that time but was considered to be a cure for all sorts of illnesses such as consumption and the ‘cough of the lungs’. Sir Ralph thought that his wife, Mary should try it when she was terminally ill and he ‘began to fret over the right dose, the best time of day to take it, the length of time to wait after one meal and before the next.‘ The family doctor advised that she could drink chocolate whenever she liked, as he knew it would make no difference whatsoever. Mary’s death devastated Sir Ralph; he had her body embalmed which then remained in the house for six months whilst he was arranging for it to be transported back from France to Claydon for burial in the family vault. The Verney family monument still dominates the interior of Middle Claydon church. 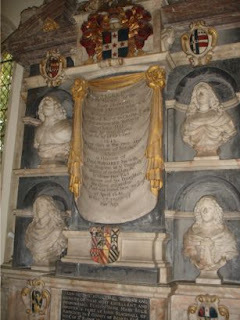 It contains portrait busts of Sir Edmund and his wife Lady Margaret with those of Sir Ralph and his wife Mary below them, flanking a drapery with an inscription to Sir Edmund and Lady Margaret, whilst below that is a black marble panel commemorating the life of Mary and announcing that this is also where Sir Ralph ‘intends to be buried’, as indeed he was in October 1696. When I visited Claydon House recently I saw the portraits of Sir Edmund, Lady Margaret, Sir Ralph and his wife Mary, Thomas, Edmund (Mun) Henry and Jack who became Viscount Fermanagh in 1703. The present house is not the house they lived in, as it was almost entirely rebuilt in the eighteenth century, with major alterations in the nineteenth century. The portraits and of course their correspondence and family records are probably all that remains of the seventeenth century Verneys. I like to imagine what it was like when they were there. When you posted those photos recently it made me recheck out the book. I borrowed it when it first came out, but when I was faced with such a massive book, I thought there was no way I could manage to read it in three weeks time (how long our check out period is). I’ve got it again, and now this makes me want to read it all the more! Hopefully there is no more waiting line for the book so I can renew it! Thanks for sharing those photos by the way!! Danielle, I hope you enjoy it and that no one else has reserved it. I borrowed it and our loan period is three weeks too, I was a quarter of the way through it when the three weeks were up and as 12 other people have reserved it I couldn’t renew it for more than a few extra days. I then read it to the end and returned it. Now I have to confess that I broke my resolve not to buy any more books – well, I asked my husband to buy it for me, so that’s not actually me buying it is it! Thank you for your wonderful and thorough review.I particularly identified with this sentence:”The most vivid and to me the most interesting parts of this book are those dealing with the family and their personal relationships and the light that throws on the society in which they lived.”Those are my favorite parts of these sort of books, too. Previous Previous post: Booking Through Thursday – Read with Abandon?